Caution:Do not use a screwdriver or punch to remove or install theseal. Using a screwdriver or punch to remove or install the sealmay damage the aluminum housing sealing surface. 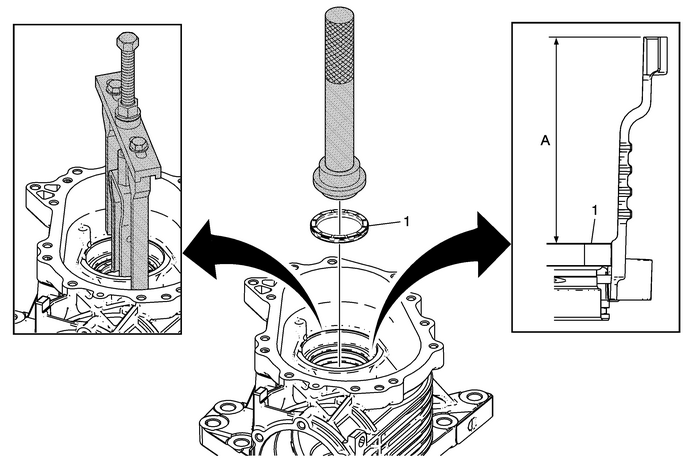 ProcedureLightly lubricate the outer diameter-(OD) of the seal with clean gear lube prior toinstallation.To ensure proper alignment and depth of the seal, take four measurements every 90-degreesaround the seal circumference, verifying uniform depth. The distance from the topface of the machined surface of the bore to the metal flange of the seal (A) shouldbe 80.0-+/−-0.5-mm (3.15-+/−-0.02-in). Failure to follow these instructions will resultin replacement seal failure. Note:Alignment of seal is critical and use of correct tool is necessary. The machined surfaceof the bore must be clean and free from scratches or nicks.